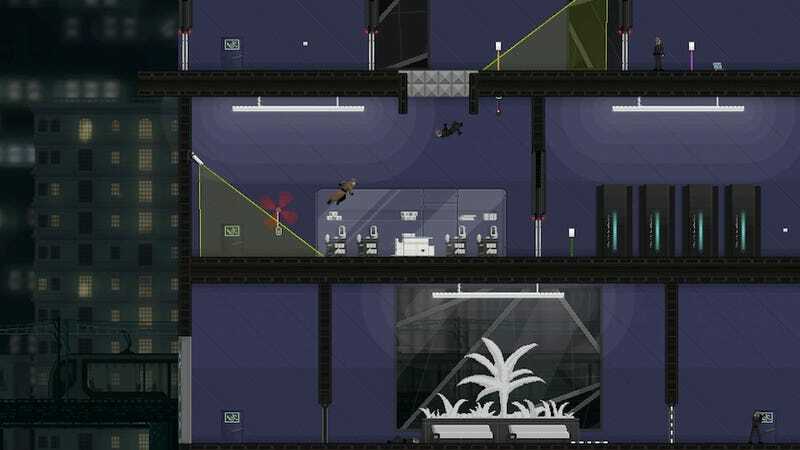 Tom Francis' outstanding stealth/hacking/spy-comedy game hasn't just been a critical success. It's selling like hotcakes. In a celebratory post at his workblog, Francis (in his usual low-key manner) shares that the game recouped its development costs in 64 seconds. Not hugely surprising, since as he points out, the entire development cost of the game consisted of a single $30 purchase of Game Maker 8. Francis goes on to share some enjoyable graphs that show just how far the game exceeded his sales expectations, explaining that because of Gunpoint's runaway success, he has quit his job at PC Gamer and decided to make games full-time. More amazingly, I can do it with total creative freedom. There’s really no pressure for my next thing to make a particular amount of money, so I can do whatever I think will be most exciting. It also means I can afford to keep being nice. I didn’t let anyone pay for Gunpoint until I was ready to put a free demo out, so everyone would have a way to make sure it ran OK on their system and that they liked it before giving me any money. This all ties in with the development manifesto Francis posted a while back (a manifesto for which Gunpoint feels like a proof-of-concept), and leaves me hopeful that we'll be seeing many more great games in the future. Or, you know, he could just make Gunpoint II: The Gunpointining. Console-exclusive first-person shooter! Stealth elements! RPG skill-trees! Mo-cap cinematics!